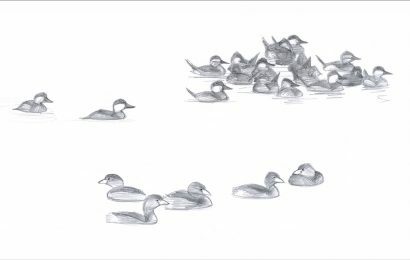 Duck migration is a feature of early spring. Over much of North America, ducks are on the move in March, or even February. One of the last species to migrate is Blue-winged Teal, a small, elegant dabbler of freshwater marshes. When the Blue-wings arrive, it’s a sure sign that winter is over. Until recently, all dabbling ducks on this continent were classified in a single genus, Anas. 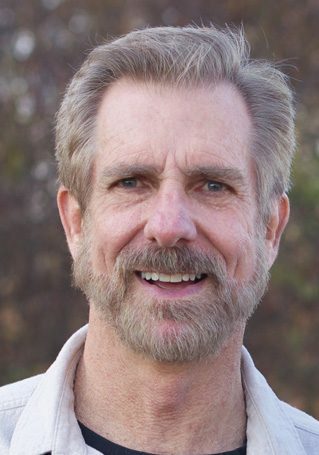 In a taxonomic shakeup in 2016, several were moved out to other genera. Blue-winged Teal, along with Cinnamon Teal and Northern Shoveler, is now in the genus Spatula(easy to remember if you think about the shoveler’s bill). 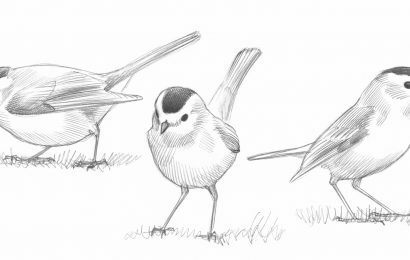 All three of these have a large, pale blue patch on each wing, usually hidden except in flight. Unlike the scientific name, the word “teal” doesn’t have any taxonomic meaning; it’s applied to various unrelated ducks around the world. Green-winged Teal is not a close relative of Blue-winged Teal, but females of the two species are similar. The Green-wing has a subtly more compact shape, looking shorter-bodied and smaller-headed, and has a smaller bill. The female Green-wing has a plainer face than the female Blue-wing, with a noticeable dark eye-line but usually no obvious paler areas. The bird looks dark except for a conspicuous pale patch — creamy or buffy yellow — on the lateral undertail coverts, showing up as pale “tail-lights” when swimming or standing. 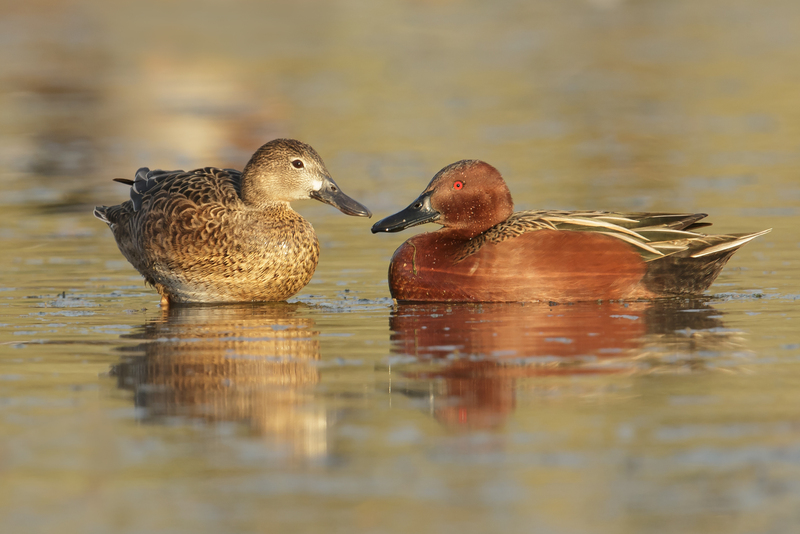 A western specialty, Cinnamon Teal, is more closely related to the Blue-wing. 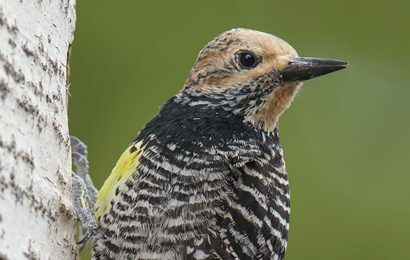 Males are distinctive at most seasons, but females can be very hard to separate. The female Cinnamon is a slightly warmer shade of brown, and the edges of its body feathers show slightly less contrast on average. Its face is often noticeably plainer, with less contrast to the dark eye-line, broken pale eye-ring, and pale area near the base of the bill. The bill itself is slightly longer and wider on Cinnamon Teal than on Blue-winged Teal. These differences are all subtle, but all of them in combination are usually enough to nail a firm ID. Males of these teal species are easy to tell apart for most of the year. But as with other ducks, they wear an “eclipse plumage” in late summer. They molt into a very drab overall plumage before molting their wing feathers; later they molt their head and body feathers again, and the males assume the bright patterns we see in winter and spring. Many ducks molt out of eclipse plumage before southward migration, but Blue-winged and Cinnamon Teal may migrate south in early fall with many of the males still in drab, female-like plumage, making them easy to overlook and harder to identify. Bill shape is still helpful, and some of the differences in female face patterns apply to eclipse-plumaged males as well. With a close look, the adult male Cinnamon Teal shows red eyes, a clear distinction from Blue-winged Teal. Size and shape. One of the smallest dabbling ducks, but not as small-billed as some species. Wing pattern. In flight, shows a large, pale blue patch on the inner part of the leading edge of the wing. This is usually hidden when at rest. Female’s face pattern. Combination of dark line through the eye, broken whitish eye-ring, and large, diffuse pale area near base of bill. Female’s body plumage. Evenly marked with pale edges on dark brown or gray-brown feathers. Undertail coverts lack the unmarked pale patch shown by female Green-winged Teal. Even without the blue on the wing, momentarily visible under the scapulars in this shot, we would know this male Blue-winged Teal by the white crescent on its gray face and another white spot on the flanks. 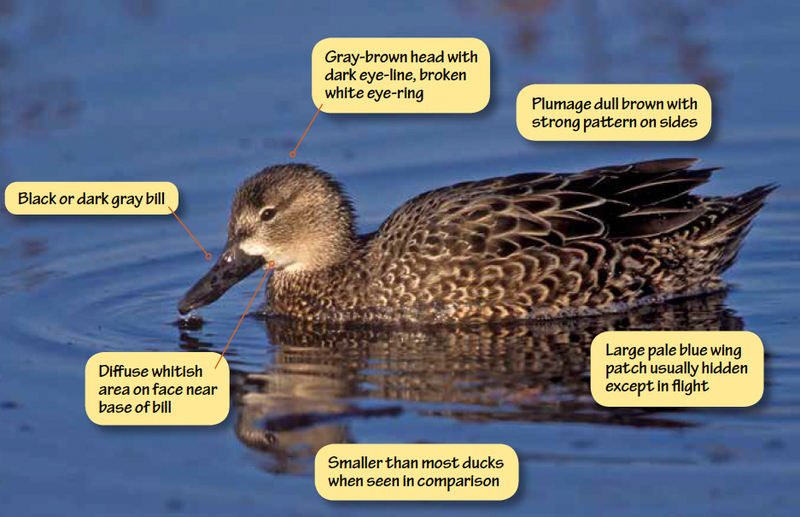 Like many male ducks, it can be identified at a glance. 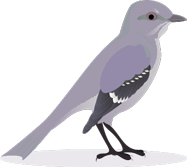 But to advance your ID skills, it’s worth taking time to study such a bird in the field, to absorb details of its shape and behavior. 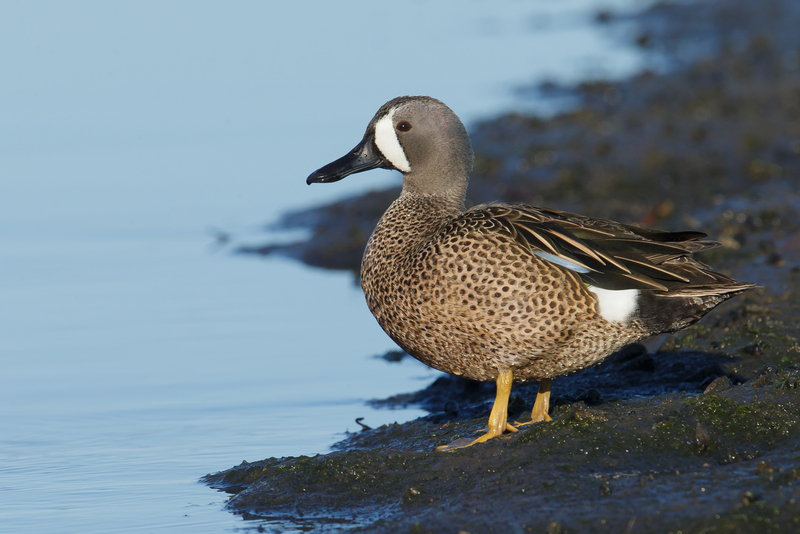 Building that kind of familiarity with the male Blue-winged Teal will help you identify the subtler females. It will also help with recognizing males in fall: many migrate south in September while still mostly in the drab “eclipse” plumage, as described above. Partly replacing Blue-winged Teal in the West, the Cinnamon Teal is similar in size and shape, but averages slightly larger. Its bill is subtly longer and wider, a noticeable difference with enough practice. The female wears slightly warmer brown tones overall than the female Blue-wing, and she tends to show a plainer face, with less contrast to the dark eye-line and the pale spot near the bill. These subtle points add up to a reliable ID in areas where the species is expected, but identifying a female Cinnamon out of range is still tricky. A male Cinnamon Teal in the dull “eclipse” plumage of early fall may still be identified by its overall warm tones and by the red eyes. 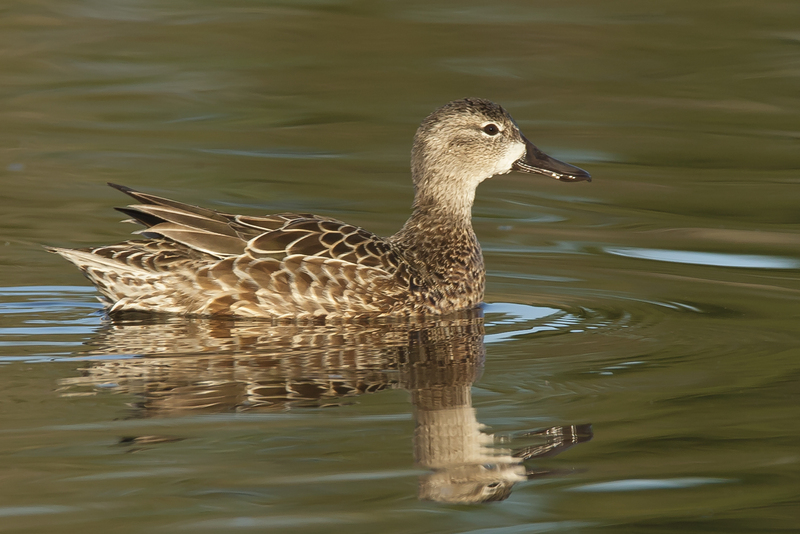 In midwinter, Blue-winged Teal are found mostly in our southernmost states and south of the border. Green-winged Teal appear to be much more cold-hardy; they stay through the winter farther north and in much larger numbers, and they move north earlier in spring. 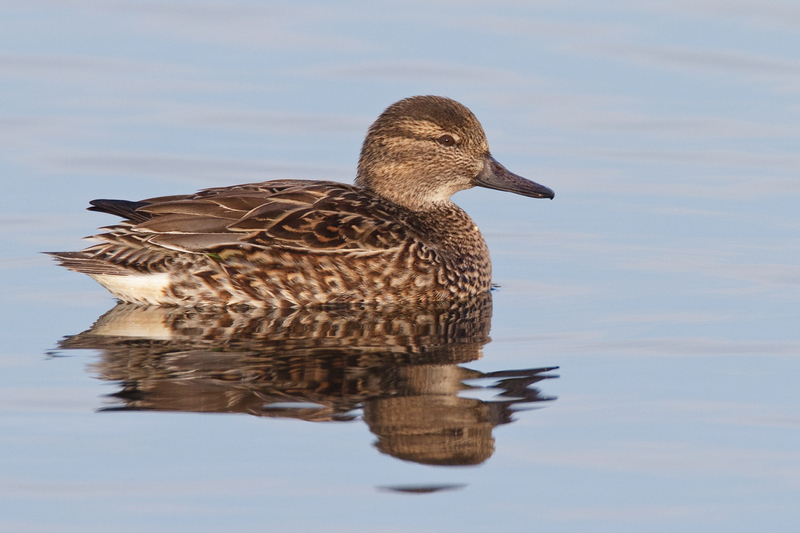 To identify a wintering or early female Blue-winged Teal, don’t rely on seeing the color in the wing, since it’s usually hidden except in flight. And don’t just fall back on ID by association with a male. Overall shape, bill shape, and face pattern are all good field marks, with more pale markings on the face of the female Blue-wing. For a diagnostic difference from the female Green-wing, check the pattern of the undertail coverts. Although the Green-wing is our smallest dabbling duck, it’s only marginally smaller than the Blue-winged Teal and the difference is not striking even when they’re together. Shape is a better clue, as the Green-wing looks more compact overall, with a shorter bill and smaller head. It generally has a darker, plainer face, lacking the broken white eye-ring and the pale patch near the base of the bill, contributing to the sense that the bird is darker brown overall. One consistent mark is the patch of creamy or yellowish white on the undertail coverts, showing up as a pale “tail-light,” quite obvious if we’re looking for it. The male Green-winged Teal has a yellow patch in the same area. As a general rule, ducks don’t migrate long distances. 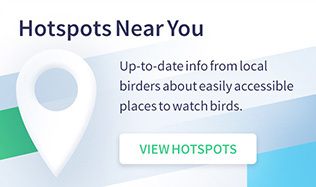 This may not be obvious if we just look at them from a North American perspective, because there are plenty of ducks that migrate from Alaska or Canada to the southern states for the winter. But if we look at the whole Western Hemisphere, we see that many smaller birds migrate much farther. Sandpipers and plovers from the high Arctic may fly to the southern tip of South America. 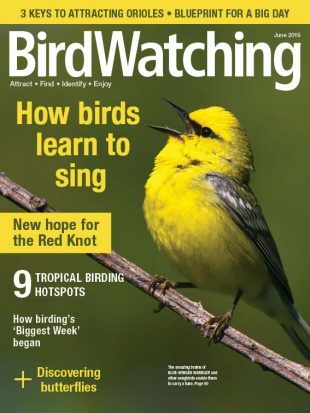 Warblers, thrushes, and vireos from Canada’s boreal forest may travel to Central America or to the Amazon Basin. By contrast, very few of the northern ducks go much beyond the southern border of the United States. The Blue-winged Teal is a major exception to this rule. Good numbers may remain through winter in Florida and along the Gulf Coast, but the majority fly farther south. Large flocks can be found wintering in the coastal lowlands of Mexico and Central America. Others spend the season on wetlands throughout the Caribbean and northern South America, with flocks as far south as Peru and strays reaching southern Argentina. 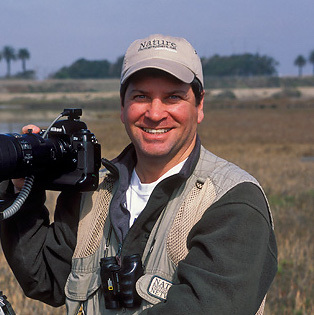 Birders on pelagic trips off the Atlantic Coast of North America sometimes see flocks of migrating Blue-winged Teal far out at sea, in swift, direct flight to or from wintering areas far to the south. Outside the Americas, the species has wandered to Europe many times and has even reached Africa.